A trainer's favorite for facilitated classroom and digital delivery. Preview their programs on our web site by following the preview link in the program description. Leadership: What't Trust Got To Do With It? Customer Service Make It Easy! The greatest challenge for "team leaders" is to let go of their work. Delegating to their team and allowing them to perform on their own is at times difficult for managers. What can managers and team leaders do to regain trust? This video provides realistic methods for rebuilding trust and gaining employee involvement. This program demonstrates how anyone can turn good concepts into reality with persuasion! Learn the skills to get your ideas accepted by others. 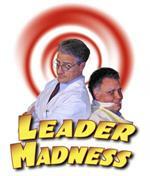 It's not what happens to you as a leader but how you react that matters is the premise of this training program. Extremely helpful for new or experienced managers struggling with the way they react under pressure. Improving front line customer service skills through empowerment training workshop with DVD. Perfect for new managers and leaders on essential skills for managing team members. Excellent vignettes to right way wrong way to manage people. What does it take to inspire a work group to greater commitment and productivity?